If you’re looking for a way to unwind and if you would like to be pampered and taken care of by skillful professionals, then our Marmaris V.I.P Turkish Bath is the right choice for you. Marmaris V.I.P Turkish Bath tour starts with a free pick-up from your hotel, followed by a comfy drive to one of the best hammams in the city. This tour comes with insurance so you do not have to worry about your security and safety. You will be able to fully enjoy your day, without worrying about any unpleasant surprises, or hidden charges. 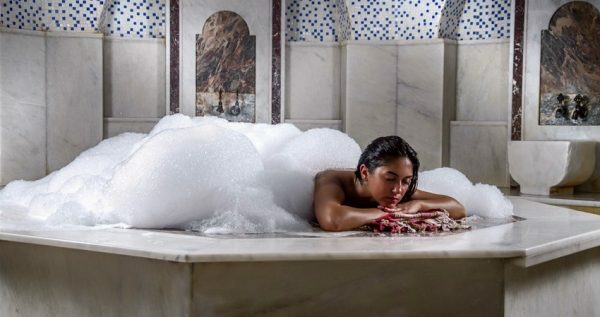 You can opt to use Turkish Bath any day and it includes treatments such as sauna, soap and foam massage, aromatherapy massage (30 Minutes), scrub massage, face mask, hair therapy, foot therapy as well as innovative fish therapy. 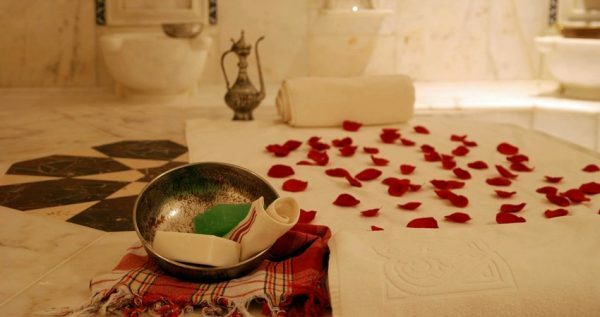 Once this marvelous experience ends you will feel like a royalty, fresh, clean and relaxed. Drinks, tips and gratuities, personal expenditures and other massages are not included in the price. The price includes only the things that are listed. You will receive a face mask treatment to make your skin silky and soft. All of the products used in the hammam are organic and natural, for example a terrific clay mask program used to treat oily parts of your skin. Aromatherapy Massage affects all your senses and makes you feel serene and relaxed in hands of professionals on this job. Your hair gets a treatment as well, and it will be stronger and shinier. You will also recieve a relaxing head massage, and a refreshing foot therapy which will help you get rid of the dead skin, followed by a relaxing foot massage. You will also have the opportunity to try a very popular fish treatment which, during which fishes are used because they feed on the dead parts of your foot-skin. This fantastic treatment lasts around 15 minutes. Book your spot on this wonderful tour with us and treat your body and soul with this unique experience. Marmaris V.I.P Turkish Bath Tour starts with a complementary pick up from your hotel, followed by a short and cozy ride to one of the best hammams in town. Once we arrive, one of the staff members will take you to the spacious changing room equipped with lockers. You will get your own key and a big, soft towel to wrap yourself in, before and after the treatment. Sauna is always the first treatment, because it opens up your skin pores so that the following treatments have better effect on your skin. Afterwards, you will get a scrub massage which will remove the dead cells from your skin, and better your blood circulation. Next, you will get to relax, unwind and enjoy all the benefits of a foam massage. This massage will give your skin pores a deep and relaxing cleanse your skin deserves. One of our professionals will apply a rejuvenating mask on your face, because our VIP treatment includes taking care of your whole body. Afterwards, you will get to enjoy a 30-minute long aromatherapy massage, which is a true treat for all your senses. You will also receive treatments for your hair and feet. Our hair treatment will benefit your hair follicles and it will make your hair shiny and soft again. In the end, you will get treatment for your feet. Our special fish therapy is an innovative way of feet treatment. Once you soak your feet in the water tens of little fishes will start eating the dead skin off your feet. This therapy fun, especially if you’re ticklish, so you will surely have some laughs as well. Once this lavish VIP tour is over, our driver will take you back to your accommodation in Marmaris. This transfer is free of extra charge, because it is included in the tour price.